Prime Minister Dr Keith Mitchell has said that the landslide victory at the polls last Tuesday will mean nothing unless by the next 5 years people would have seen their lives improve in a positive way through the policies and decision that will be taken by his government. 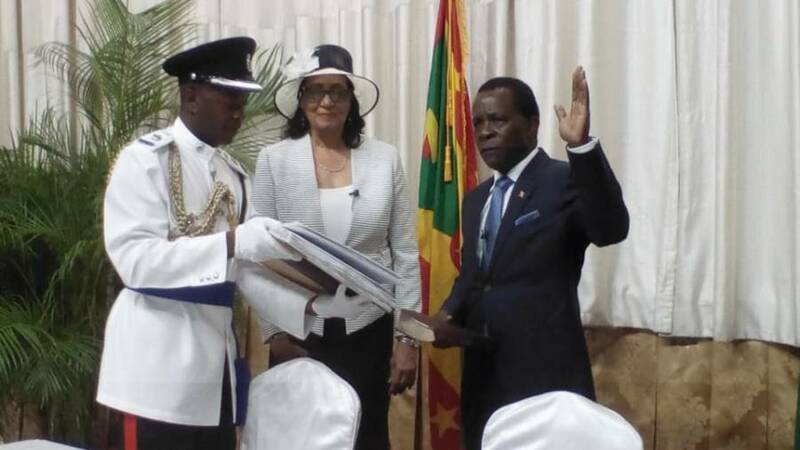 “This victory won’t mean anything unless by the end of this next term we lift more people out of poverty; we send more people back to work; we empower families – and we make every Grenadian proud,” he told the packed Trade Centre, after he was sworn in by Governor General Dame Cecile La Grenade as Prime Minister for the 5th time. Telling the people that he stands ready to lead a united nation, Dr Mitchell said that the mission of his government is for unity to not only a moral obligation but a developmental necessity. “We cannot build this nation if we leave out or marginalise people who do not share our political preferences; or who have different ideas on how to push this nation forward. Grenadian patriots know no colour. They are guided by their conscience, and their own sense of family and community,” he said. “Today I come with an open hand to my friends and neighbours who voted for the National Democratic Congress. You had a right to your views and a right to your preference. But this battle is over – and we have a nation to build. Let’s build it together,” he added. “I am humbled by this your confidence in me and the team you have chosen, but that is just the elected team, the real team is all of us,” said Mitchell as he told the people that one of his first tasks would be to write an official letter inviting the NDC, which failed to win a seat in the Parliament for the 2nd consecutive time, officially requesting their participation in the development of the country. “We don’t have to fight each other every day of the year…this electoral war is over, let peace reign,” Mitchell said, acknowledging that in a democracy, people are entitled to support whichever party or group they want to. Mitchell said it was regrettable that the constitutional referendum in 2016, which would have allowed, among other things, for the country to join the Trinidad-based Caribbean Court of Justice (CCJ) as its final court, and the appointment of a Leader of the Opposition in the Parliament, at all times had been rejected by the population. With no elected Leader of the Opposition, the Governor General will rely on the Constitution to guide her so there will be some semblance of opposition in the Parliament. Mitchell, the longest-serving prime minister within the 15-member Caribbean Community (CARICOM) grouping, reminded the audience that the real power lies not in the hands of the elected representatives, but those who stood in line to cast ballots on Tuesday. He called for a “total commitment from all of us….to do all we can to make the lives of those ordinary people better,” adding that he would do his “utmost” to lead the country into prosperity.